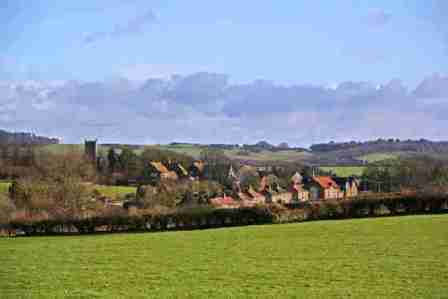 The village of Sixpenny Handley lies in the heart of the historic and picturesque Cranborne Chase in Dorset, between the Romano British village of Woodcutts and the roman road of Ackling Dyke. A part of the Cranborne Chase and West Wiltshire Downs Area of Outstanding Natural Beauty. The Parish includes the hamlets of Minchington (in the West), Gussage St Andrew, Woodcutts, Deanland (North), Pentridge (South) and Woodyates on the county boundary in the East. The population of the parish is approximately 1300. The village name is derived from two medieval “hundreds” ‘Sexpena’ and ‘Hanlega’ which, over the years, local folk and the highways authority reduced to the memorable 6d Handley. Through the centuries the village suffered a series of fires and, in 1892, the whole village was virtually destroyed due to its remoteness from the nearest fire appliances. The church, dating back to the 13th century, remains and there several small shops which line the main street giving it a traditional village atmosphere. The landscape is predominantly agricultural with large open fields of arable and dairy. Having been awarded one of the very first Lottery grants, for its size, the village boasts some excellent sporting facilities including football, cricket, tennis and bowls. The village Primary School looks after the local children before they move on to Cranborne and then Queen Elizabeth School Wimborne.